There may be something special developing in Sin City, and it has nothing to do with the Strip. 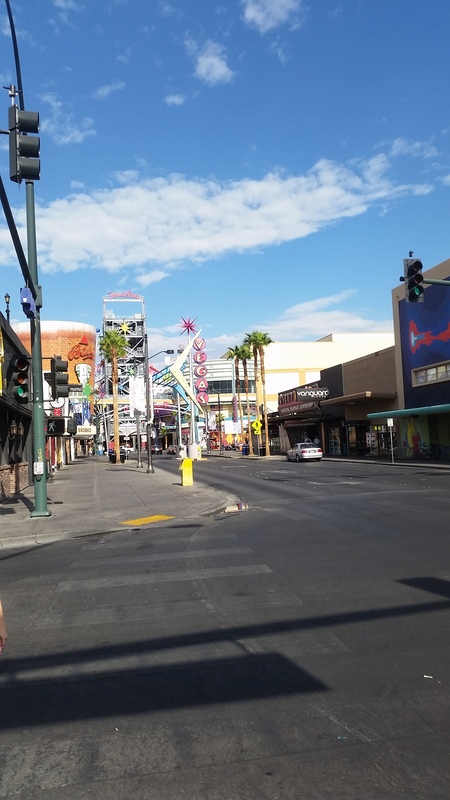 I’m talking about the revitalization of Downtown Las Vegas, a section of the tourism hotspot that has been somewhat cast aside over the years. In fact, some people don’t even realize there is indeed an official Downtown Las Vegas. For years, the glitz and glamour of the Strip sparkled, while Downtown lied in its shadow. 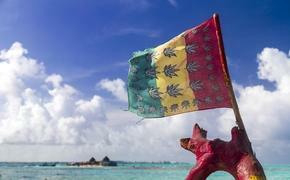 But, thanks to the $350 million Downtown Project, that all may begin to change. The Downtown Project, officially launched in 2012, aims to make the downtown area a place of inspiration, entrepreneurial creativity and forward mobility. Of the $350 million invested, $200 million will go to real estate, $50 million will go to small businesses, $50 million will fund education and another $50 million will jumpstart tech startups through the VegasTechFund. So far, the Downtown Project has invested in nearly 120 businesses, including 79 technology companies. 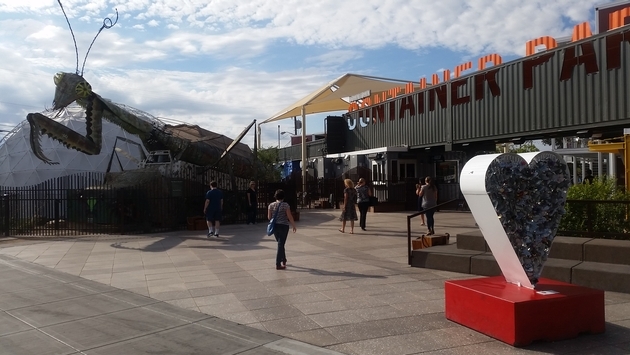 Many of the businesses lie within Container Park, an open-air shopping and entertainment venue opened in December 2013 built from 43 shipping containers and 41 locally manufactured cubes. Container Park businesses range from boutiques to art galleries to furniture stores to offices to a barbershop housed in an old boxcar and caboose bought on Craigslist. 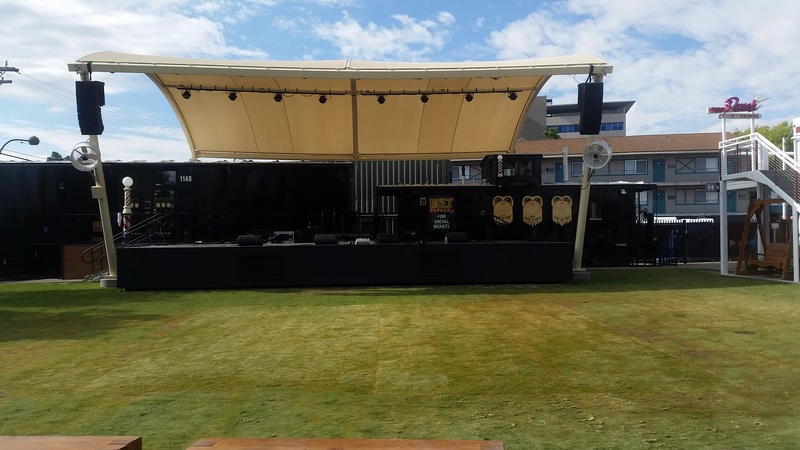 You will also find several restaurants and bars within the 1.1-acre spread, as well as an interactive play area called the Treehouse (complete with a 33-foot slide, a NEOS play system and giant foam building blocks) and a stage and grass area for live performances. Oh yeah, and a 55-foot-tall praying mantis sculpture born from the Burning Man festival greets visitors to the park. At night, the mantis shoots flames from its antennas while a DJ plays music within it. I am not making this up. This isn’t simply a new shopping and entertainment center, though. You can tell it means a lot to the locals, from the business owners to the longtime residents of the area. This is everyone’s baby, and a great deal of care and planning has gone into a project that locals hope will attract new visitors and stimulate growth. In fact, representatives of the Downtown Project noted that not just any business would be accepted. Businesses must be original, unique, inventive, community-oriented and sustainable (it doesn’t hurt if they are quirky, too). It’s all about making Container Park and the surrounding downtown area more diverse. In exchange for creativity, the Downtown Project provides 100 percent funding to get off the ground—a rarity these days—and even offers lessons to chefs who are first-time business owners. A variety of interesting businesses have already sprouted from the project, including O Face Doughnuts, a gourmet doughnut and coffee shop situated within the repurposed John E. Carson motel building on Sixth Street and Carson. 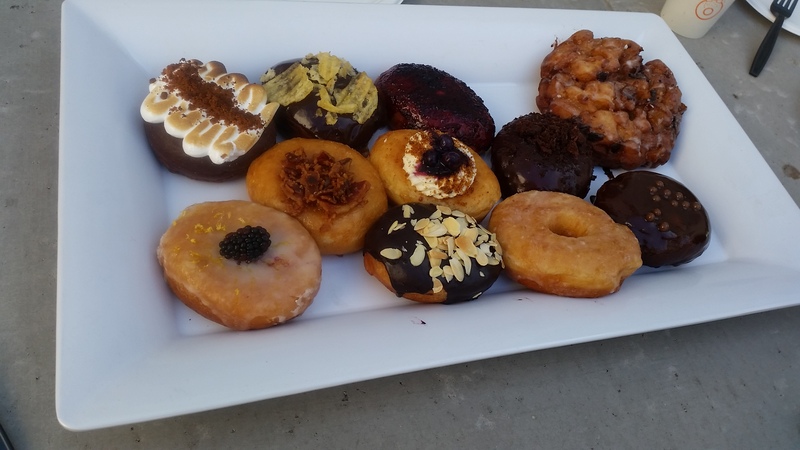 O Face Doughnuts Chef Crystal Whitford, who has worked alongside big names such as Thomas Keller and Wolfgang Puck during her career, lets her imagination run wild here. TravelPulse was treated to apple bacon fritter doughnuts, apple pie doughnuts, s’more doughnuts, key lime doughnuts, chocolate ganache doughnuts and more. There are even vegan doughnuts. And with new businesses come new jobs. The Downtown Project had already created 893 jobs as of Sept. 15. It’s one of many reasons why the Downtown Project is making waves in Vegas and beyond. This is a story that only figures to build, aided by the unique stories of the local business owners themselves.